When you are in combat do retreat or push on? 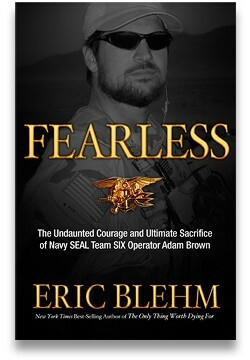 Well Adam Brown would never retreat he pushed on as far as he could, until the war would kill him on March 17th, 2010. While prepping his equipment for every mission he would pack the Arkansas Flag his brother, Shawn that had given him. He always carried into battle, tucking it proudly between his body armor and his uniform. He believed it would be a token to help him return home to the family that loved him. If you ask any of his team's members they said "He would do things at full throttle." They say that's why that made it out alive some many times. You get the job done and you get out. Adam Brown always knew God was watching he would say it to his family many times in life. His ability to show people the right way in life was one of the major qualities to Adam. If you asked any members of his team if they were inspired by Adam, they would all say "Yes." They say "You couldn't get mad at the guy, what isn't there to not like." Adam Brown's Legacy to never give up in life, be the best person you can be, and grab life with an iron fist and rule, you make your own choices in life, just hope you have the best choices to your benefit. Adam Brown will be missed and his legacy will forever live on.